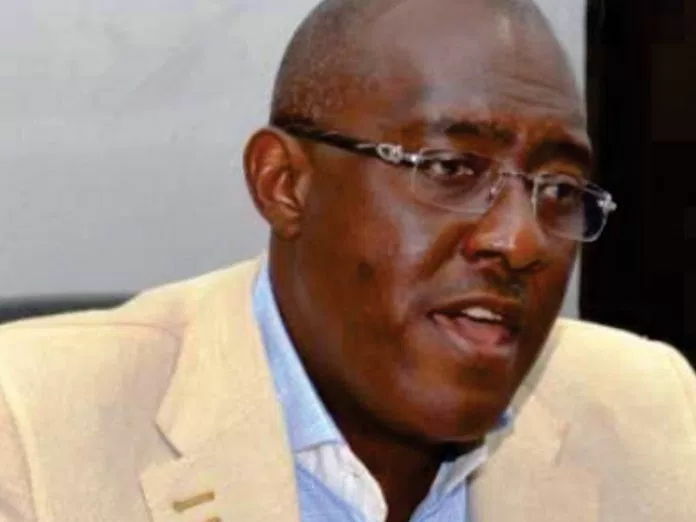 Determined to attend his money laundering trial, the former National Publicity Secretary of the Peoples Democratic Party (PDP), Olisa Metuh, was on Monday carried into the courtroom on a stretcher. Metuh, who is standing trial on allegations of money laundering to the tune of N400m was ferried into the premises of the Federal High Court in Abuja in an ambulance with registration No: Q4420FG belonging to the National Hospital, Abuja. The trial judge, Justice Okon Abang, had in a ruling at the last adjourned date ordered that Metuh, who was said to be lying ill on a hospital bed in Enugu, appear in court yesterday to face his trial or risk revocation of his bail. However, the trial could not go on yesterday when the matter was called as the judge had to adjourn trial on compassionate grounds. Metuh on the stretcher on which he was laid, appeared very frail and sickly. Abang in a short ruling on submissions by counsel said the court was minded to grant an adjournment. Justice Abang accepted the plea of Ikpeazu that the trial be adjourned for one month and consequently adjourned to March 14 for continuation of trial. “The 1st defendant is in court, but his counsel informed court that he is indisposed to continue trial, and therefore pleaded for one month adjournment. The court also noted that the prosecution counsel did not oppose the oral application of Ikpeazu that the matter be adjourned to one month. “I have considered the application of counsel to the 1st defendant, and the response of the prosecution counsel. “I must say that the court of law must be firm, and fair to all parties. “Court of law must also be humane”, Abang said. Adding: “On account of the condition of Metuh (1st defendant) that I have seen this morning in courtroom, I am inclined to grant an adjournment to enable the 1st defendant attend to his medical needs. Consequently, this trial, God’s willing, has been adjourned to 14,15, and 16 March 2018 for continuation of trial. Earlier, Tahir had told the court to use its discretion to grant an adjournment, while appealing for understanding from the defence lawyers. “May I dis-abuse the mind of the court, the gallery and counsel for defence that we are prosecutors and not persecutors. “We are doing our job and in doing that, we have no ill feelings about anybody”, Tahir said.